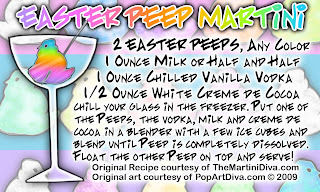 The MARTINI DIVA: MARSHMALLOW PEEP MARTINI FOR EASTER! MARSHMALLOW PEEP MARTINI FOR EASTER! PLEASE DRINK RESPONSIBLY & DRIVE RESPONSIBLY!